"I came here to defend the capital." Following up on their previous releases of the first and second Sakura Wars (Sakura Taisen) OVAs, ADV launches the first five episodes of the twenty six part television series on this disc. The show is based on a popular Sega video game set in a steam powered early 1900s Japan, where the remnants of the Demon Wars are being managed by the secret divisions of the military. For the TV series, the creators flesh out the story told in the first OVA, as each of the characters are introduced again. At the invitation of the divisional commander, Ikki Yoneda, Sakura Shinguji arrives in Tokyo as the latest addition to the Imperial Flower Combat Division, a secret wing of the military whose mission is to defend Tokyo from the demons that still exist after the Demon Wars. In typical Sakura fashion, she manages to miss her appointed contact at the station, and heads off looking for her new headquarters, and is shocked to find out that they are located at a theatre, and that as their cover, her team are a group of stage performers. Her nervousness also brings out her clumsy side, causing an embarrassing entrance, which ruffles more than a few feathers. Already apprehensive about her abilities as a fighter, when Sakura learns that she too will have to learn to act, her confidence is deflated, and the cold shoulder she is receiving from her fellow teammates isn't encouraging her, but as her true abilities begin to make themselves evident, her place in the Flower Division looks a little more secure. The pacing of these inaugural episodes is a lot more natural than the rather forced developments seen in the preceeding OVAs. The characters, and Sakura in particular, each have their personalities introduced slowly, which I'm finding far more enjoyable. One aspect that I really liked about my previous encounters with Sakura Wars is the steam driven technology. The Spirit Armor, or Koubu, which the girls use to fight their adversaries, doesn't get that much attention early on, but Sakura's influence on it does open up the implications of her presence. The Wakiji, huge mechanical beasts which terrorize the city under the command of Crimson Miroku, make their first appearance, and the stage is set for future confrontations and the underlying story arc. 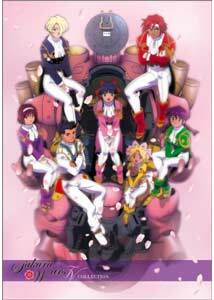 Although the introduction to the Sakura Wars universe afforded by the OVAs was enticing, the longer running time of the television series is already paying dividends, as the series gets off to a great start. Image Transfer Review: Image quality is good, but not outstanding, though most of the issues appear to be source related. Colors are well saturated, and black levels solid, but there is some color bleeding in places, and the overall look is a little soft and grainy, especially in deep blues. There is a fair degree of aliasing throughout, most evident during panning sequences. Audio Transfer Review: Audio is available in either Japanese stereo or in an English 5.1 mix. The Japanese track is completely suitable, with clear dialogue and appropriate use of the directionality for music and foley effects. The English dub track has a more expanded soundfield and additional presence. No technical issues were noted. Extras Review: The opening volume is available as either a single stand alone disc, or with a box to hold the whole series, though I can't comment on the quality. Extras are a little light, consisting of clean opening and closing credit sequences, plus trailers for Saiyuki,Chance POP Session, Neo Ranga,Sailor Moon Uncut, You're Under Arrest Mini Specials, and Noir. A production notes booklet is supposed to be available, which wasn't included in our review copy. Menus are nicely designed, as is the packaging. Sakura Wars TV is off to a nice start, with the character reintroductions and a taste of what will follow in terms of conflict. The expanded format length is allowing a less rushed approach, as the elements that make up the series fall into place. If you enjoy the steam punk technology, and a well rounded story development, this series promises to deliver.